Open Hand presents two high-profile events each year to raise funds and awareness in support of our work. Through event sponsorship, your company or organization can raise the profile of your brand in the community by reaching thousands of highly engaged metro Atlantans who support Open Hand. Your brand will be included on all pre-event promotions, event websites, on-site signage, and post-event acknowledgements. Other benefits include VIP tickets, email marketing opportunities and, of course, civic pride. 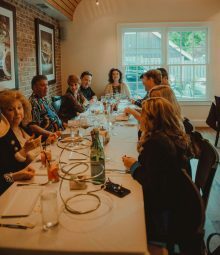 Dining Out for Life is an international dining fundraising event that is held in 60 cities throughout the United States and Canada. Open Hand Atlanta just celebrated our 25th year of participation by enlisting nearly 100 metro Atlanta restaurants to join together for to raise more than $180,000 in support of our nutrition programs. As one of Atlanta’s largest citywide fundraisers, Dining Out for Life exposes thousands and thousands of people to our work…and to your brand. With participating restaurants from Midtown to Roswell and Vinings to Decatur, your company will be well represented. This annual gala is one of the most highly anticipated fundraising events in metro Atlanta. While guests enjoy an evening of great music, hand-crafted cocktails and exquisite cuisine prepared by many of the top chefs from Atlanta’s finest restaurants, your brand is front and center. And as a PITK sponsor, you can also use the event as an opportunity to entertain clients or reward key employees. Party in the Kitchen will be attended by over 400 guests representing a diverse cross-section of the metro-Atlanta community. A recent study on the demographics of our donors indicates they are highly educated, earn income of 2-3 times the national average, work in executive and managerial occupations, dine at upscale and ethnic restaurants, and travel frequently. They also helped Party in the Kitchen raised a record $650,000 in 2016! To learn more about how events can demonstrate a positive return on your sponsorship investment, please contact Jean Goffaux, DIrector of Donor Engagement, at 404-419-3333 or by email.